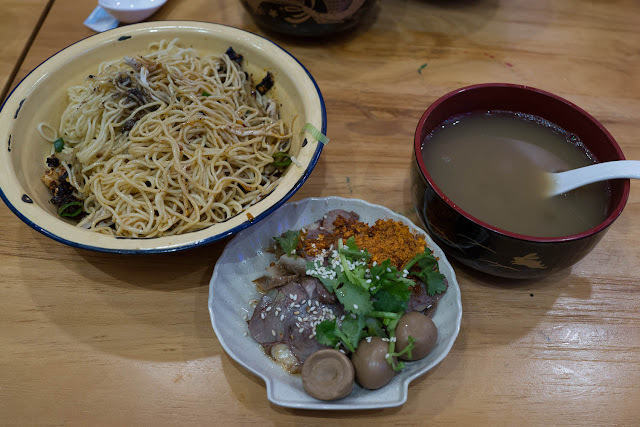 Chongqing style noodles, enamel plates and bowls of chili noodle goodness. Make Your Mouth Water on George Street locks it all in. 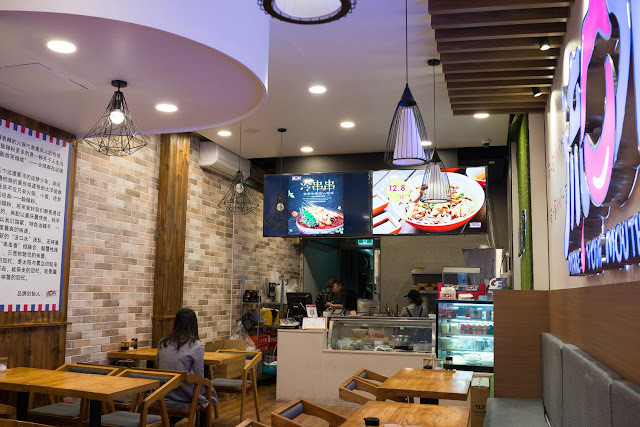 Chongqing style noodles have really conquered Sydney. Their hometown favourite, xiao mian (little noodle) is easy to like and the number of places to get the spiced bowl of goodness continues to grow. Make Your Mouth Water along the not-quite-built light rail on George St has been opened for a little while. It's been a little covered up by the chain link fencing and plastic bollards that are the norm for the cinema district at the moment. 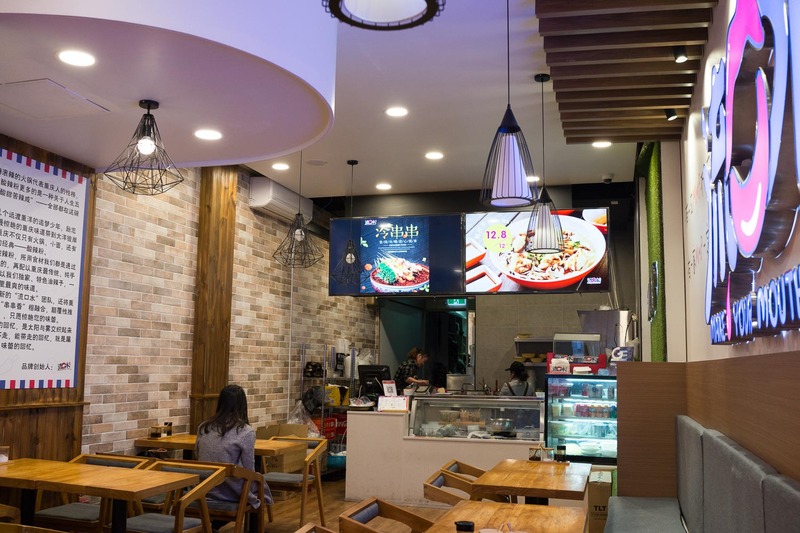 Inside the canteen style plain wood and brick pattern resto is a pretty straight forward set up. Order at the counter, watch a few bubbling pots of beef and admire the stacks of enamel bowls waiting to be filled. The enamel bowls are functional and a thankful break from a rising trend toward disposable plastic. Not only do they look good, they are a comfortable size for one. 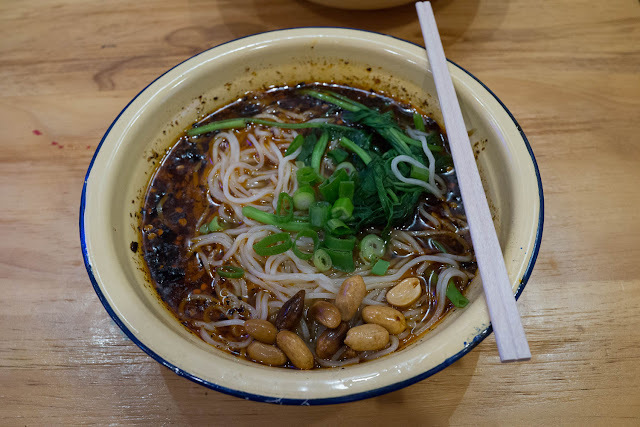 The Chongqing spicy noodle ($10.80) is a standard xiao mian, noodles in a chilli and Sichuan pepper studded broth with a scoop of crunchy peanuts, sliced green tops of shallots and some wilted greens. 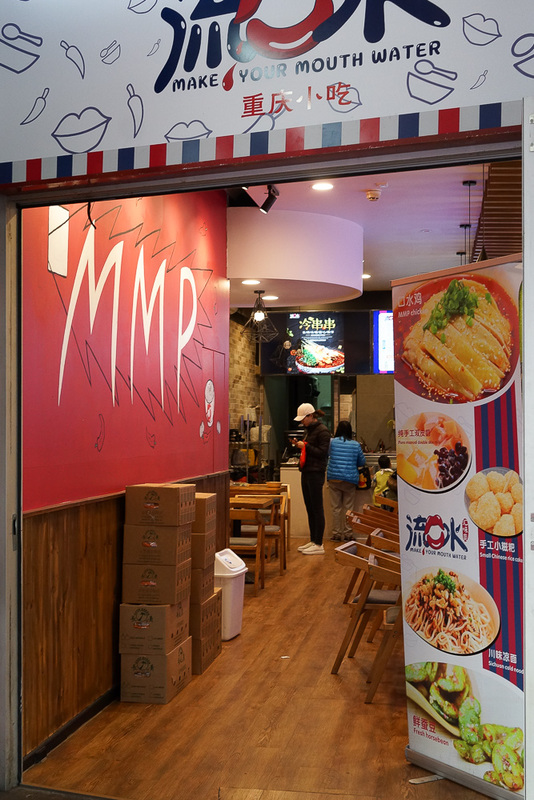 Up the game with the spicy noodle with pea and meat ($12.80). The peas are similar to small chick peas but without the characteristic 'beak', they're cooked until soft and ladled into the soup. 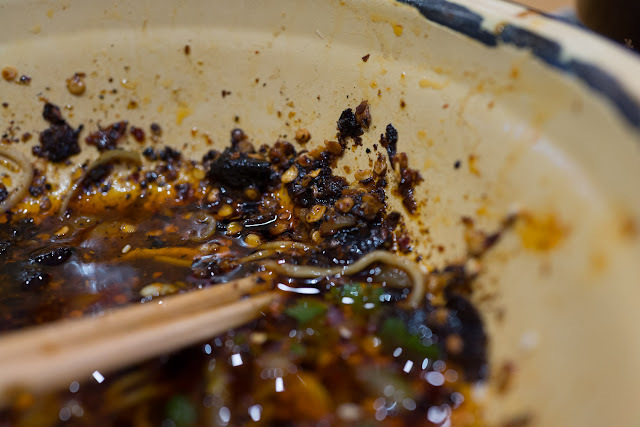 The meat is minced and spiced, swirling around with the broth and noodles to make a mincey and nutty soup at the bottom of the bowl once the noodles are long gone. We try twice to order the 'Special Chinese Food' but no luck, so we go for the Spicy beef with rice ($13.80). 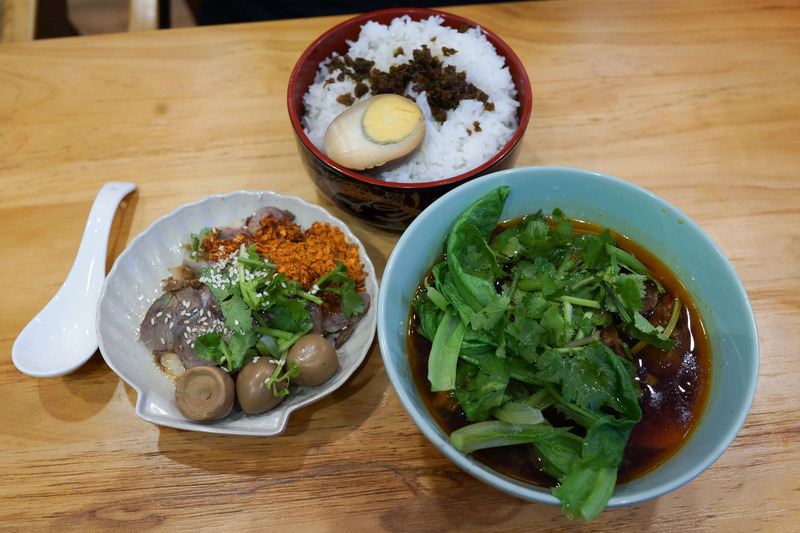 This is served in two parts - a bowl of rice with half boiled tea egg and a sprinkle of dried and salty pickled vegetables, a new favourite for us, and a bowl of sliced roast beef in a chili broth. Each part is solid on it's own, but mixed together is a little magic. The small dish of beef belongs to the next set, it was a little confusing when they weren't brought out together! Beautiful chili remnants in the bowl. The Sichuan spicy cold noodles and brine and green bean porridge ($14.80) presented a small challenge to our tastebuds. 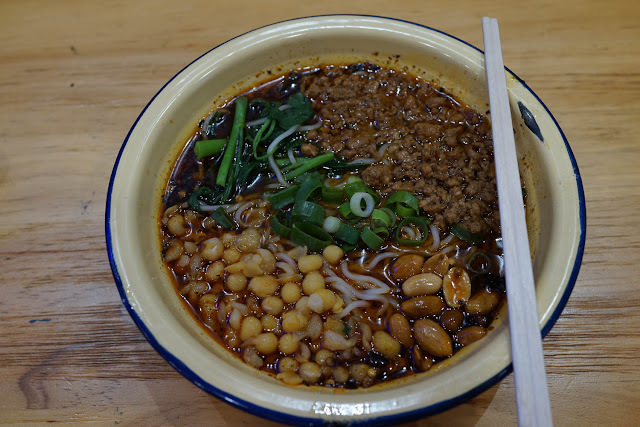 The noodles taste like they have been sprinkled with sugar, we expected chili savoury but got hit with crunchy sweet. A bit more chili balanced it out a little, but that hit of sugar wasn't a winner for us. The green bean porridge was also a little sweeter than expected. The small plate of cold sliced beef with brightly orange powdered chilli tried to save the meal. 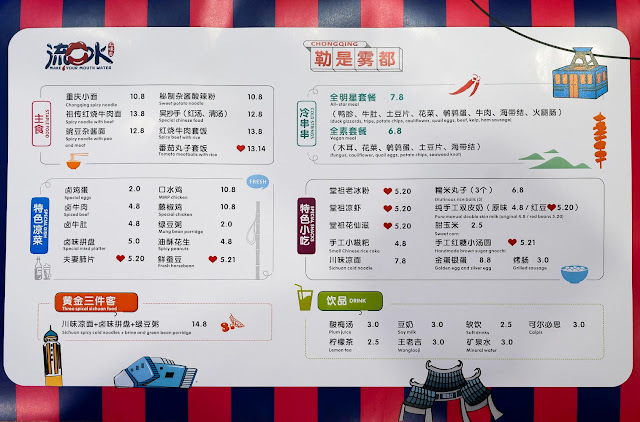 Menu, complete with stylised images of Chongqing. 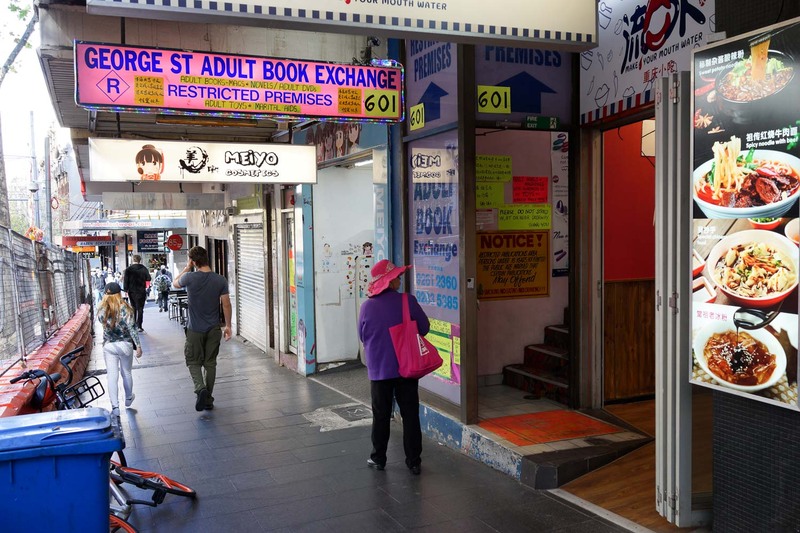 Make Your Mouth Water is at 601 George Street, Sydney. Just look out for the adult book exchange conveniently located next door, perfectly positioned for all the unlucky blokes from "If You Were the One". Yes please. Thanks for the good reporting.